After years of unjust captivity by those who would exploit her mysterious powers, Analia makes a desperate and dangerous bid to escape the craft that has been her prison for as long as she can remember. By chance, she stows away on a passing merchant ship, which could lead her to freedom…or a life worse than death. Staying hidden from the fearsome demon captain and his crew proves impossible, however. When Analia is discovered, she must keep her secrets close while contending with her freshly awakened desire for the brutally handsome demon. But those whom she escaped want her back, and will stop at nothing to reclaim her. The Demon's Possession is the first installment in the bestselling paranormal romance series, Shadow Quest. Shadow Quest is a unique mix of genres that incorporates paranormal romance, fantasy romance, and science fiction romance. My characters are based loosely in mythology with some kick-but mythical creatures such as demons, dragons, witches, and fey-like beings. Since they’re all from different planets, I suppose they’d be considered aliens. Paranormal romance fans are ravenous, and my Shadow Quest series hits the spot. 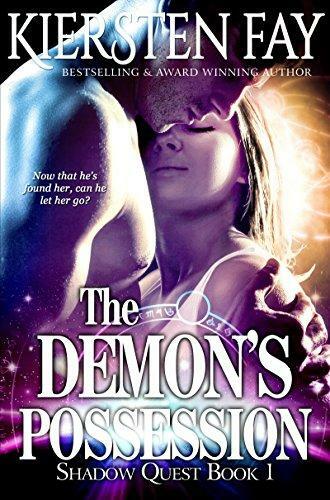 Readers have told me they have read The Demon's Possession several times over and still enjoy it. It’s a series that draws you in and makes you long for more. Readers who enjoy witty romance, alpha males, and lots of action will want to take this epic journey. Q - What inspired the world you created in The Demon's Possession, having it take place in space and different planets? I’ve always been interested in scifi, fantasy, paranormal, and mythology. I thought about the kind of romance novels I enjoy reading and what I liked about them: the idea that there could be a supernatural world within our own, veiled from sight. Then I thought, “What if all these creatures from lore were really from different planets?” After that, the world building came naturally.